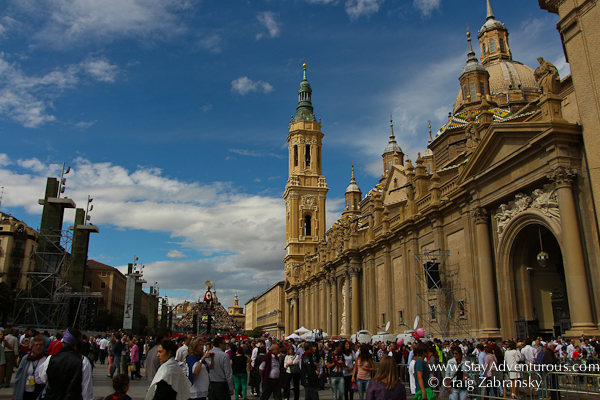 The road to Zaragoza can be classified as an easy drive, an historic event, or an epic pilgrimage. And a visit to the city located in the heart of Aragon will allow you to discover all three roads to Spanish city. Whether you land in Barcelona or Madrid, the road to Zaragoza takes just a few hours on the main toll roads. It is essentially equidistant between Barcelona and Madrid and just over a three hour drive from either city. 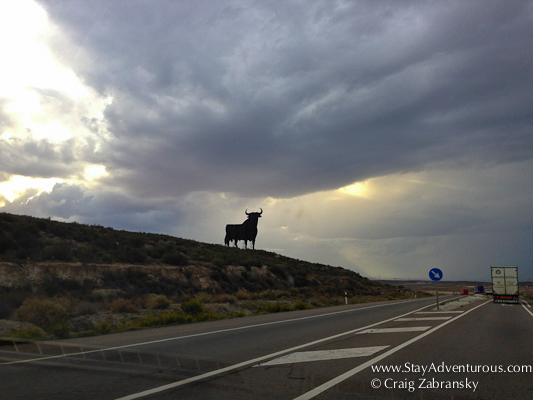 It is easily navigable for travelers who decide to rent a car in Spain and opt for a Spanish Road Trip. If all roads lead to Rome, then there was a road to Rome from Zaragoza. Actually, the name Zaragoza actually comes from Caesar Augusta (CaesarAugusta / Zaragoza say them both fast) . The city was founded along the Ebro River in Roman times about 20 BC. Although the name seems to have been altered or adjusted with time and control, (especially when the Moors took control as one of their most northern cities in Spain) the name origin remains and easily traceable to present day. 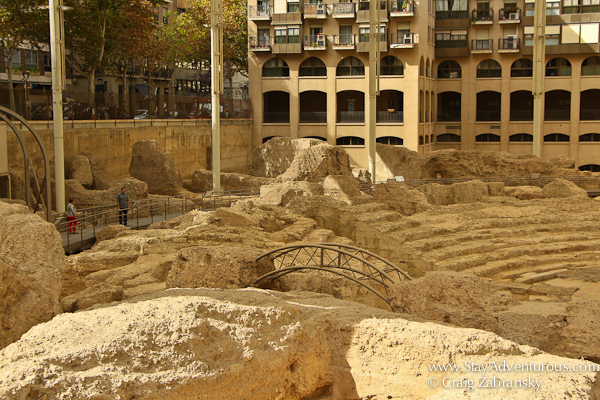 Plus, today visitors can tour excavated Roman ruins directly in the center of the city too. Self-guided audio tours provide the details and also can test your Spanish. I am not sure I passed, but it was certainly an unique adventure walking among the ruins in the center of the Zaragoza. 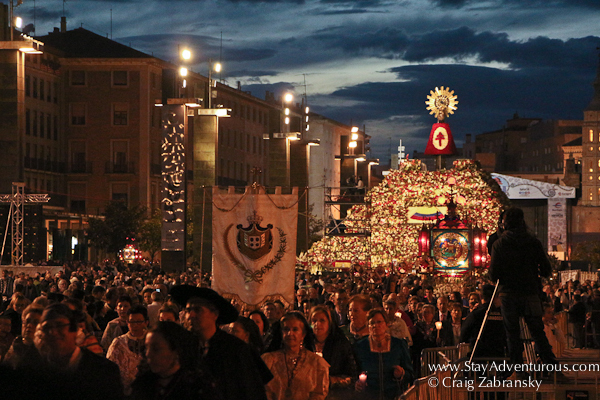 Gaining popularity beyond Aragon, Spain the Festival of Pilar, continues to grow and attract the faithful for a pilgrimage to honor the patron saint of the Zaragoza, the Virgen del Pilar (virgin Mary of Pilar). The 10-day event combines festivals, fairs and a religious pilgrimage. The “fiestas” culminates on October 12th, when hundreds of thousands of people dressed in the traditional costume of Aragon bring flowers to the virgin. The flowers, placed in the center of the Plaza del Pilar form a giant pyramid and remain for several days for all in the city to visit. There are many roads to take to Zaragoza, but regardless of when you visit, or which road you take, the views of El Pilar at sunset makes traveling to Zaragoza always a good idea. This post was done in conjunction with Enterprise Rental Car, but the words and opinions are as always my own. Spain is one of my favorite countries. Love hearing about a new city to visit! The photos make me want to get on the road.